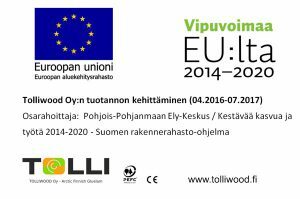 Tolliwood Oy has been operating in the wood-processing industry since the 1970s and has over 20 years’ experience of producing glue-laminated timber. The company’s glue-laminated timber factory is conveniently located in Nivala Industrial Park, at the junction of important highways. This location offers good transport connections in all directions. The company’s production techniques enable offering perfect solutions for the construction industry, yard and park construction, and the furniture industry.